Innkeeper Sandy’s favorite town for shopping in the area is Hayward, which is about one hour east of Woodland Trails Bed and Breakfast. 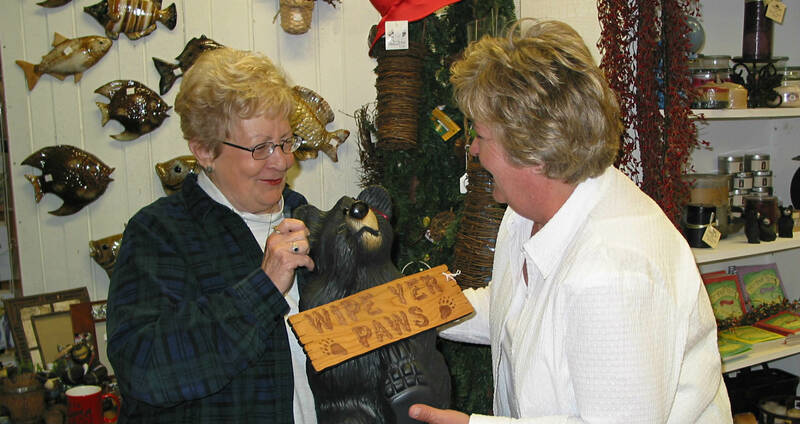 The photo shows Sandra with Mika Ahlgren, owner of Sandra’s favorite shop, Lodge Accents. Duluth is also about an hour away if one takes the short route over Wisconsin Highway 35 from Danbury to Superior and on to Duluth. The waterfront area offers both shopping and the scenery of Lake Superior. If you are lucky, you might see a 1,000-foot ship entering or leaving the harbor. The closest shopping is in Danbury, Webster and Siren. Danbury which is just four miles from Woodland Trails Bed and Breakfast while Webster and Siren are just a few minutes further on. From May through October, consider visiting some of the local historical sites.